What is Imodium (Loperamide HCL) used for? Imodium (Loperamide HCL) is an oral medication used to treat patients suffering from acute or chronic diarrhoea. It operates by slowing the rhythm of digestion and movement of food through the digestive system to allow enough time for fluids to be absorbed into the body. This action allows stools to harden and prevents diarrhoea from occurring. Your doctor may also recommend the use of this medication for the treatment of other unlisted conditions. How should I use Imodium (Loperamide HCL)? Always use Imodium (Loperamide HCL) according to your doctor`s instructions and those included with the packaging to get the safest and most effective results from treatment. The normal dosage is one tablet taken at the first sign of diarrhoea followed by further doses of one tablet administered every six hours while symptoms persist. These should be swallowed along with a large glass of water and may be taken with or without food. You are also suggested to increase your fluid intake drastically as severe diarrhoea may lead to dehydration. What are the side effects of Imodium (Loperamide HCL)? Serious side effects possibly requiring emergency medical attention are intense stomach pain, bloating, deterioration of your symptoms, severe diarrhoea that is bloody or watery, or a severe skin rash. Inform your doctor as soon as you experience any worrying or intense symptoms to make sure the correct adjustments are made to your application frequency or dosage to stop more health problems from occurring. 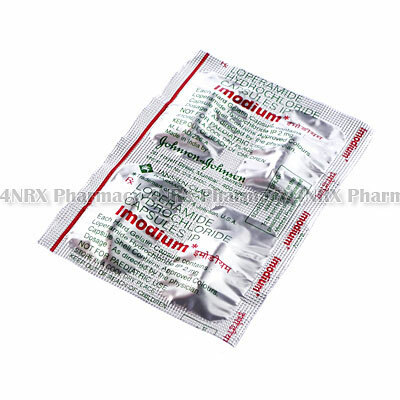 Imodium (Loperamide HCL) should not be used by patients who are children under the age of twelve or who have diarrhoea caused by intestinal inflammation, diarrhoea caused by bacterial infections, diarrhoea containing blood, ulcerative colitis, or conditions blocking the digestive tract. Also inform your doctor if you have decreased liver function as this condition may cause unexpected health complications requiring special adjustments to your regimen. Strictly use Imodium (Loperamide HCL) as prescribed and follow all instructions provided by your doctor. Safe, suitable, and optimum dosage can vary and is dependent on the patient`s health and medical history, as well as the condition you are treating. Imodium (Loperamide HCL) may not be safe or suitable for all patients. Always ensure your doctor is informed if you are pregnant or breastfeeding, using any other type of medication (including non-prescription medicine, vitamins, and supplements), as well as if you have any allergies, other illnesses, or pre-existing medication conditions.